A makeshift memorial for the fatal police shooting of Alton Sterling outside the Triple S Food Mart next to a mural of Sterling July 21, 2016 in Baton Rouge, Louisiana. BATON ROUGE, La. — The Justice Department will not pursue federal civil rights charges against two white police officers whose fatal shooting of a black man outside a convenience store last summer sparked waves of protests across the country, the department announced Wednesday. 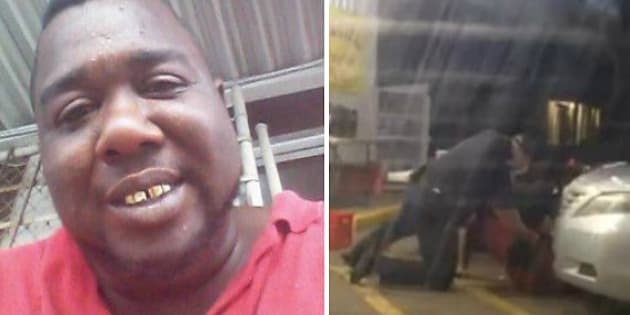 The Justice Department probe concluded 10 months after Alton Sterling, 37, was fatally shot by officers Blane Salamoni and Howie Lake II as a bystander captured video. The officers were responding to a call of a man with a gun, but it’s unclear from the video whether Sterling was a threat. The killing set off nationwide demonstrations, with people decrying police terror against black lives. Citing anonymous sources, the Washington Post, The New York Times and The Associated Press reported on Tuesday that the Justice Department would not file charges against the officers. Cory Amundson, acting U.S. attorney for the Baton Rouge area, confirmed the news Wednesday, saying an “exhaustive” investigation had been conducted. “All of the prosecutors and agents involved in this case have come to the conclusion that insufficient evidence exists to charge either officer,” Amundson said at a press conference. Wednesday’s news marks the first time that the Justice Department under Attorney General Jeff Sessions has declined to prosecute police officers for a possible crime, according to the Washington Post. Louisiana Attorney General Jeff Landry is still considering whether to bring state charges. Mourners pay their respects at the funeral of Alton Sterling on July 15, 2016. The Washington Post, which first reported the decision, reportedly published its story before the Justice Department contacted Sterling’s family. Rep. Cedric Richmond (D-La.) expressed disgust that federal officials didn’t tell the family sooner. Sterling, a father of five, was cut down by multiple police bullets on July 5, 2016. He was hit in the chest and back near the Triple S Store, where he frequently sold CDs. He died at the scene. A witness caught the shooting on camera. Baton Rouge police said the shooting happened after the officers were called to investigate reports of a man with a gun. Store owner Abdul Muflahi told HuffPost last year that he witnessed the shooting and did not see Sterling with a gun. He said he did see officers remove a handgun from Sterling’s pocket. Following the killing, Baton Rouge police placed Salamoni, a four-year veteran, and Lake, a three-year veteran, on administrative leave. Less than two weeks after Sterling was killed, Gavin Long, a former Marine from Missouri, opened fire in Baton Rouge, killing city police officers Montrell Jackson, 32, Matthew Gerald, 41, and East Baton Rouge Parish Sheriff’s Deputy Brad Garafola, 45. Long wounded three other officers. The protests eventually ceased, and national media attention began to drift away in mid-August, when torrential rain in southeastern Louisiana caused massive flooding that claimed more than a dozen lives. Baton Rouge officials said before the release of the federal report that officers had received additional training to better equip them in how to deal with protests. The department last year was criticized for its displays of military-style equipment and the use of ear-splitting sirens called LRADs. Officers were also accused of haphazardly pointing assault rifles at protesters and journalists. This story has been updated with news that the DOJ confirmed the officers will not be charged. David Lohr covers crime and missing persons. Tips? Feedback? Send an email or follow him on Twitter.